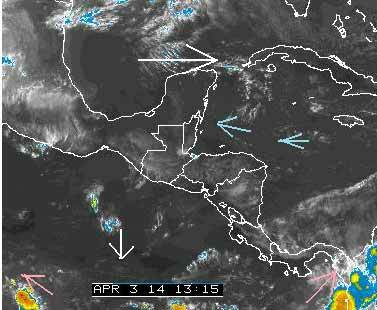 Belize NMS: Seasonably warm and mostly dry conditions will continue to dominate our weather. 24-hour forecast: Sunny and warm weather today, tonight skies will be partly cloudy, tomorrow will be mostly sunny. Shower activity if any will be isolated. Winds: East-southeast 10-20 knots with occasional higher gusts. Marine Outlook: (Friday night) Winds: E-SE 15-25 kts with higher gusts. Seas: Rough. Waves: 4-7 ft. Little or no rain. General Outlook: For Friday morning thru to saturday morning is for warm and windy conditions with only isolated showers. Again, early in the morning, a few showers to the north of Belize, and to the south, this time just inside the Belize border. The ground is getting really dry, earlier than most years. A worrying sign. There have been several years in which the last rains of the season fell in mid-December, then came the cold spell – December to end of January or even to mid-February and then the dry spell with soaring temperatures and strong winds up to the end of May. What we are seeing now is mild and I am sure that at 2 feet deep the ground is still damp. not having dug up 2 ft deep this week on my farm, looking at my young fruit trees and their water stress already, tells me, sadly, that the original opinion might be correct. although a very late start with the dry, my plants indicate it is a serious dry already. those of us watering trees pray for rains on or before their 'usual' arrival - around may 20. Up in Consejo where we seem to have a drier climate than the rest of Belize, the dry is really setting in here and with very high temps and lots of wind. I have to water potted plants twice a day. Thankfully we have irrigation on the farm so our trees are having to be watered more and loving it.....but costly as the pump is petrol!!!!! We were doing some pole work last week. . . .2 - 3 weeks ago, we were hitting wet ground about 8" 20cm deep. Now we are getting to softer ground about 16" 40cm down. So Trees should still be OK, but plants with shallower roots will be in trouble soon. As you can see in this graph. . .. 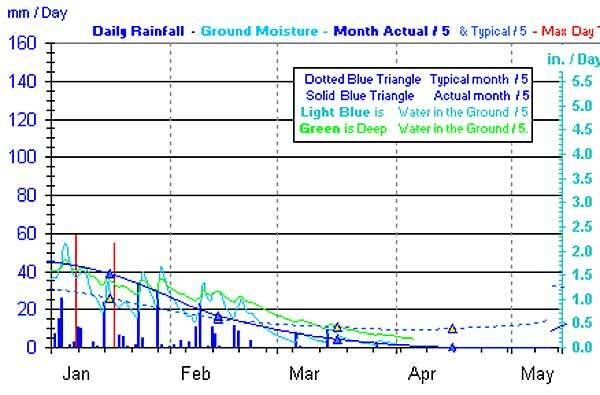 The light Blue line is the shallow water in the ground and that is now hidden under the dark blue actual monthly rain line. But the light Green line is still just a little bit up, that represents water deeper in the ground.